KATIE: So Waffles, why have you been sitting there all day long? You haven't even eaten your breakfast. Or mine. WAFFLES: I'm waiting for the Great Leper Can. WAFFLES: That's what I said, Boss. Leper Can. It's almost St. Paddy's Day and the Great Leper Can is supposed to bring me treasures, like gold and stuff. KATIE: Ok, whatever you say. So what's with the green hat? WAFFLES: Well duh! He needs something to put all my treasures and gold in. I'm putting it here on my kitty lounger so he knows it's mine. KATIE: Who says that kitty lounger is YOURS? I'm pretty sure the nice people at Peach Industries sent that lounger to ME. WAFFLES: But Boss, it doesn't have your name on it or anything. KATIE: What... do I have to have my NAME printed on everything that's mine so you don't steal it, touch it, eat it or sniff it??? KATIE: WAFFLES! How about you just tell the nice people about the great kitty lounger deal? WAFFLES: Ok, Boss. To celebrate St. Paddy and the Great Leper Can, Peach Industries is offering a special 20% discount on your entire purchase for THREE whole days. 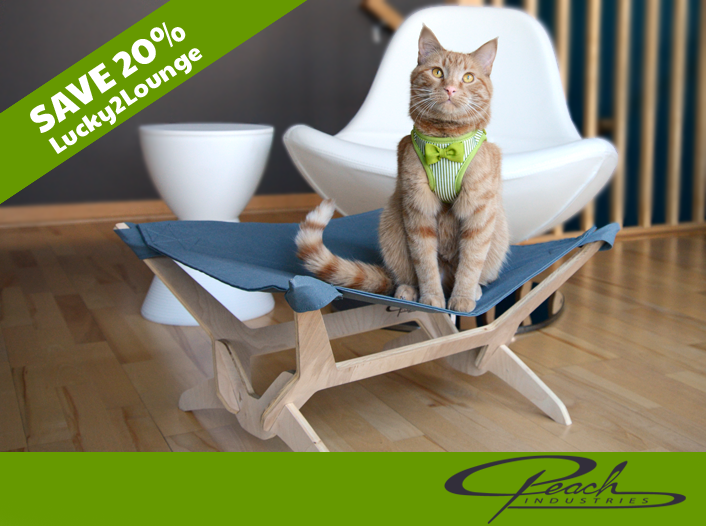 Just enter promo code Lucky2Lounge when you check out. The Great Leper Can will make sure whatever you buy is extra lucky. Visit Peach Industries on Facebook for more kitty lounger fun! I thought the Great Leper Can only came to the most sincere pumpkin patch. no wait.. that's not right..
Do I have to tell you how much I love Waffles' vest? We are really laughing out loud! Let us know how this Great Leper Can works out. 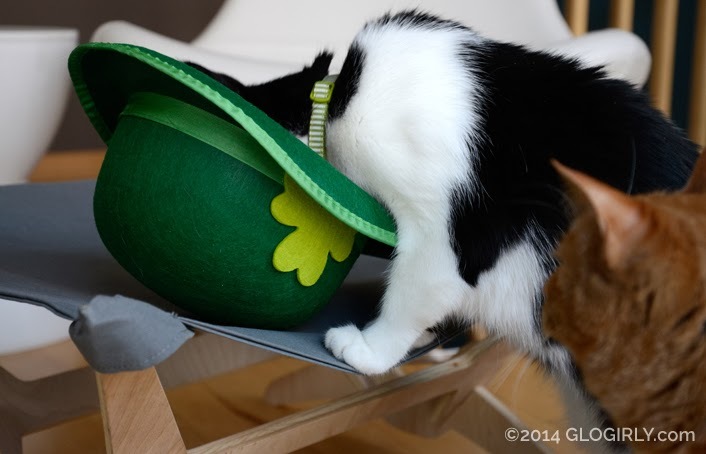 We're willing to put out green hats, too. MOL! Thanks for starting our day off with a smile. Wow. 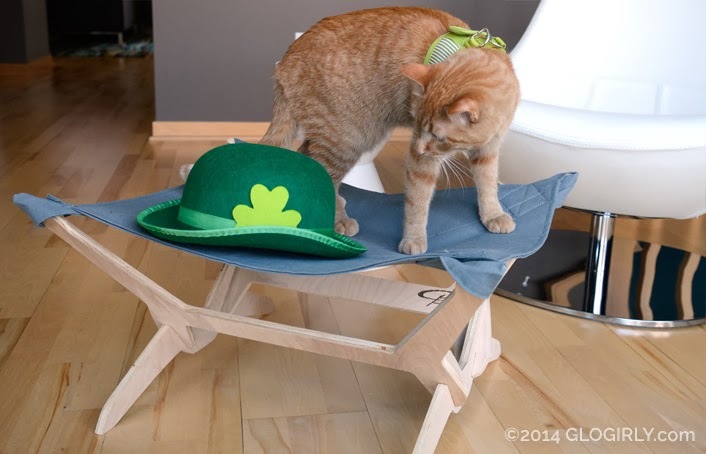 That is about the most original interpretation of St. Patrick's Day that I ever heard! At least nobody had to wear that hat. Forget the gold...we're hoping that Leper Can brings us lots of nip! 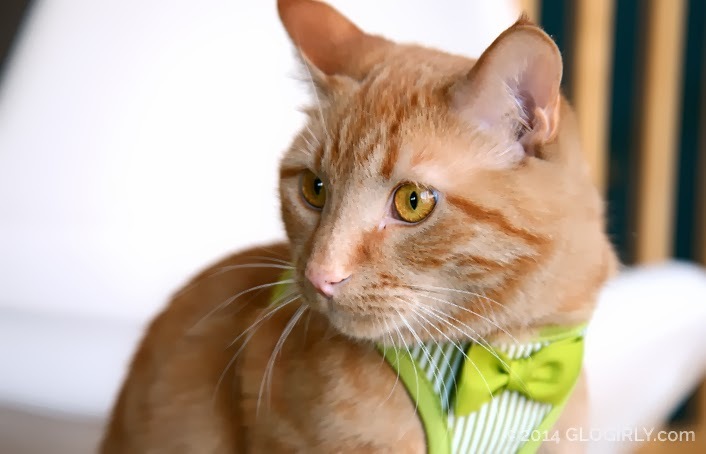 Yoo're looking quite daper in your vest, Waffles. That's nice of Peach Industries. The Mom wishes hers could afford a nice lounger for us. She thinks we'd really like it. I think I know where that green dude might be hiding Waffles! we LOVE our lounger...and may have to look into another one. A leper can? Oh my, that sounds unsanitary. - Crepes. 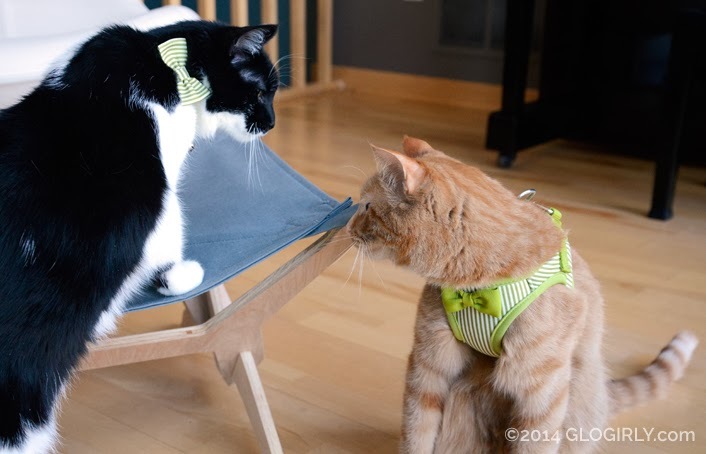 You two must be the best dressed cats in all blogdom. 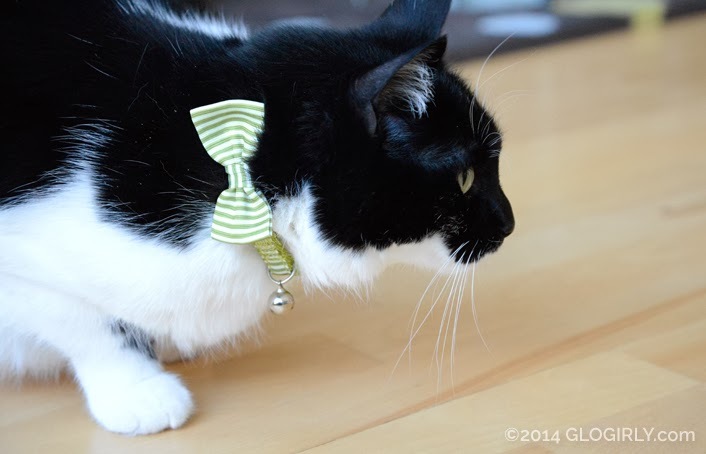 LOVE how Katie's coordinated collar bow matches Waffles' natty stiped vest! That lounger sure does look cozy!!! And you both look so Pawsome in green!!!! Lookin all festive in the St. patty's colors!!! Nice! "Leper Can" OMC BEYOND ADORABLE! We hope the Great Leper Can comes and visits us!! 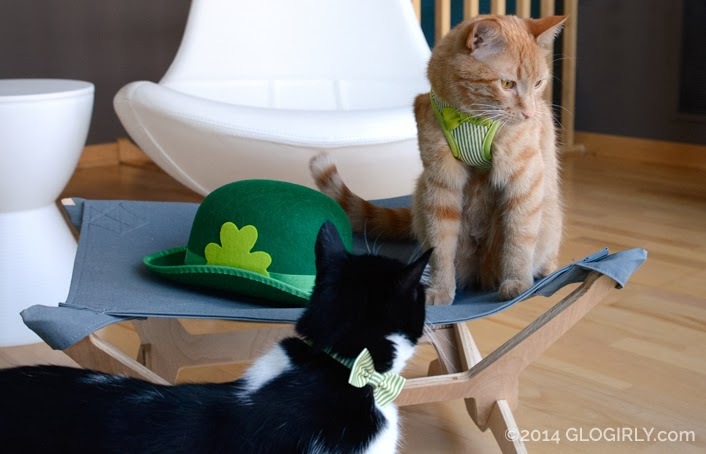 You both look great in your St Patrick's Day outfits!! That sounds like a good deal. Do they come with a leper can and gold and treasures?? Yo, Katie, a collar with a bow? You look cute but I think there’s too much Comfort Zone in the Townhouse. You looks furry dapper in your vest Waffles. Who knew green and ornj went so well together. Very cute! As well a a therapy cat, I think Waffles is trained to be a model cat. He's a multi talented Renaissance Cat! They both look so adorable. Love the photo of Waffles with his head tilted. What a great lounger!!! Mes is going to goes and has a look! Faraday: It was a FAIR QUESTION. 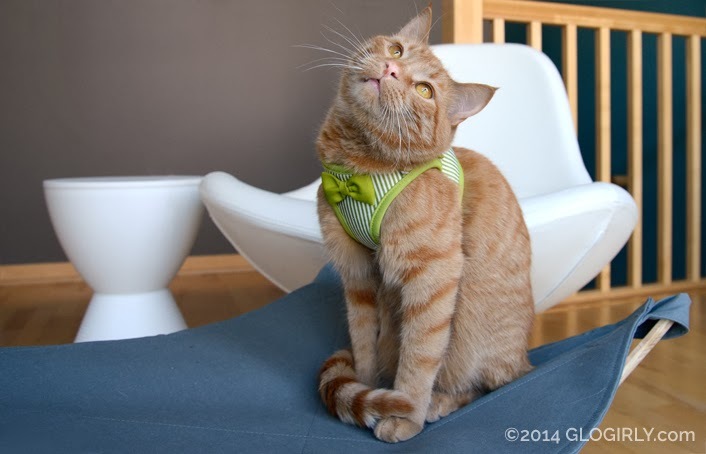 Allie: *eyeroll* On another note, Mother says to tell Waffles he looks dapper in his new harness.